For several years I've been running my VP2 station with the understanding that the rain gauge "may" record low during times of heavy rain. A good friend about four miles away from me has many times reported to me more rain than what my Davis unit has recorded. He has a basic 1" diameter gauge. I figured there was the distance between our locations, his location in regards to trees, buildings, etc., (mine ISS location is fantastic...right? ), the "if it rains hard it will record low" idiom, etc., that was causing sometimes an inch or more difference in readings. Naturally, if we were talking about scattered showers the differences are understandable, but when talking about a set-in, widespread rain system it seems that 4 miles wouldn't make too big of a difference...the differences in our gauges did make me wonder. The two measuring instruments are roughly 60' apart from each other. The CoCoRaHS gauge has a large pine tree probably 30' to the NW of it. I know, to do a better comparison the two gauges should be basically mounted side-by-side. But...a whole inch of difference? Seems like a bit much to me. I've never looked into it, but can the VP2's rain gauge be "calibrated"? OK: What was the range of rainfall rates that were logged during the storm? At 60-feet separation, "micro-climate" differences definitely have to be considered. I can recall, on Guam, refueling one wing-tip tank on EC-12K and getting "douched" but the sailor refueling the other wing-tip tank, 120-feet away, not getting a drop. My family's business (father started in 1946) sat on a corner downtown, basically center of town. I've looked out the front (west) windows and it be pouring down rain and out the side windows to the south not a drop be falling. Also, the one end of a bridge being dry, the other end wet, etc.,. It just seems that with that small of a distance and the storm conditions that we had the readings would have been closer to each other. I will say that the other day I compared a smaller rainfall amount and the two gauges were much closer in their measures. It could have been a quirk, it's just hard for me to understand an inch difference. But, it's hard for me to understand lots of things...just ask my wife. Here's a screen capture from my graph page. The best that I can tell, either side of midnight was when the center of Alberto was passing over us. I was thinking that the rainfall rate should be higher than shown, but there was a lot of slow, steady rain involved. At that time, though, I was snoozing. I see your wife studied the same book(s) as mine (wink,wink). I don't think they have to study...it's in their DNA!!! Calibration instructions attached, from the Davis “rain collector with mountable base” user manual (the same one used in the VP2). Quite frankly, I have given up on the accuracy of the rain tool in the VP2. After trying on 4 separate VP2 rain bases using both the old collector and the new “aero cone” collector design, I gave up. I tried calibration and that didn’t help. My Rainwise 111 always matches my CoCo gauge in all material respects, my VP2s, rarely. I should connect my Rainwise to my VP2 ISS, and move on with life. Unfortunately, it would likely be an ugly setup in my back yard, so my wife would likely veto the concept. See next post from Randy at ValentineWeather on how to hook up the Rainwise. The rain rates are not bad at all shows just how inaccurate they can be. I've purchased multiple stand alone Davis rain gauges thinking I could get one to work but it was always the same. (Before they came out with the cone) My conclusion something was inherently wrong with gauge design itself and I think Davis coming out with the cone proves my findings of design flaw. 30% error was my typical experience with the Davis tipping bucket. Sometimes it may be much closer 0-5% but next time 30 even 50% off. It was like opening a box of chocolates you never knew what you were going to get. I finally discovered the Rainwise 111. For about $80 you can install and Rainwise 111 8" diameter tipping bucket gauge which will follow the manual Cocorahs closely. It also has adjustment screws but tend to come close right out of box if mounted on level flat surface. You can use the existing Davis plug and just splice into it.....green/yellow one side and red the other. All of you do realize ya'll *are* terrible enablers, don't you!!!??? So, we take the terminals of the RW gauge that are intended to go to the wired "inside counter" and connect them to the rain connection port of the Davis ISS? Rather than the signal going to the counter it goes to the ISS and the ISS interprets and sends to the Davis console with no problem? That's it? Yep. Works exactly the same. Randy talked me into doing this (a/c fan too) and never looked back. Yes you will just slice into counter wire (2 wires) . Leave a couple feet of wire connected to counter plug you can still use counter to calibrate without disrupting the station rainfall later if needed. Very simple to do. You know, if I hadn't ever put up that Cocorahs gauge I wound't now this...or be worried about it. Ignorance is bliss...sometimes. I'm part caveman, so I think I can do this....sounds like a simple job. Ok, is the shelf necessary or is a d-i-y option doable? Apparently it's not a requirement. No. However, if you do get the RW, make it as level as you can get and make it sturdy enough that strong, gusty wind will not move it. For example, I have mine screwed into the top of my cider block wall, it ain't movin' for nuthin'. If I get it I'd like to mount it on the backside of the post that I have the Davis unit on. I have the top of the post sawn off to slope away from the Davis bucket...I wonder if I just mounted the RW where the top of the bucket was a few inches above the top of the post if that would keep the rain splatter from the post away from it...??? Probably just need to bite the bullet and re-saw it to slope the opposite direction. Has anybody fitted bird spikes to the RW bucket? That is one thing that I have *really* enjoyed with the new style Davis bucket...I've had zero problem with debris/avian-gifts. Hmm, VW your cutting board shelf sounds interesting. If I cut the 4x4 post level I could simply screw the cutting board down to it. Does the RW bucket need an opening below it so the water can pass through easily? ?...in other words, not a solid surface below it? Current VP2 rain gauges are no where near the consistency of earlier models like used on the WMII but they can be calibrated there is no question about that but being a tipper like any tipper different rate rates will provide different rain fall. I'm actually using a green cedar fence post ranchers use around here. You can always make a drain hole if needed on platform. I'm up enough for leveling on one side so have no issues. These have no bubble gauge so just level the direction tippers sit most important with 3' level across top. Does the RW bucket need an opening below it so the water can pass through easily? ?...in other words, not a solid surface below it? You can always make a drain hole if needed on platform. Not necessary. There's ample room underneath for the rain to easily pass through, solid surface or not. I wasn't positive because mine sits up anyway. That looks like plenty of room...if it rains heavy enough to clog that up I'll be looking around for an ark to run jump into!!!! To get straight to the point here, I don't even use my VP2 for my "official" rainfall measurements. Even in light rain, it under-reports (albeit very little-but still). 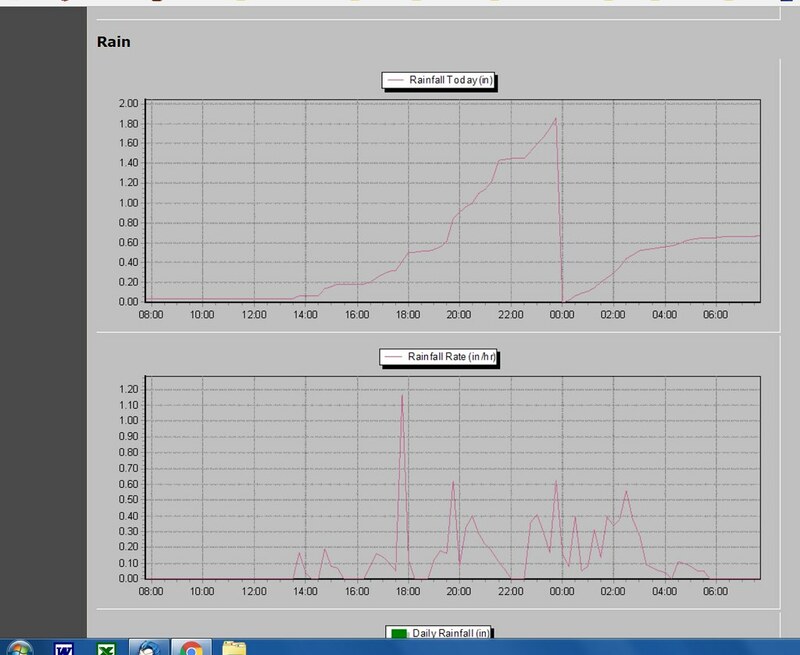 All I use it for is a tool to see how hard it's raining; aka the rain rate. I rarely even pay attention to how much it reports. My cocorahs guage is what I use. I just don't understand why there are always posts like these because an electronic (spoon tip) rain guage will never be as accurate as a manual. It might be interesting to compare, but in the end the manual will not under-report.